The visitors at LaSalle Square Unity Garden often symbolize our mission in many ways. Today was a perfect example. As usual, we have a constant stream of harvesters and veggie donors visiting all day. Come evening the real "rush hour" begins as this garden alone often hosts between 50 and 100 neighbors every night! 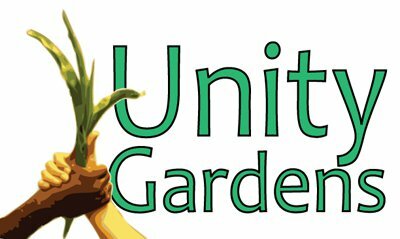 In order to keep up with the Unity demands I have begun to have my business and community meetings at the garden. Today I met with landscape architects from Whiteman Petrie to share our plans and systems, then the Saint Joseph County Health Department to discuss how we connect people to the vegetables here and to plan an on site Reducing Obesity Coalition event. During the meetings we saw over a dozen harvesters, and 3 neighbors dropping off extra harvest from their yards. Those gathered shared recipes, talked about their histories with gardening and even had some tasting tours! The photo captures Robin Melewski sharing her basil with Wendy, a new connection grown. After, as I was leaving, I bid farewell to Wendy, still harvesting, Kim, a previous garden leader, and new neighbors all gathered to enjoy healthy fresh food from the gardens and couldn't help but reflect on what had really grown here today!